From a usability standpoint of view this makes totally sense of course. Not only Google but also your users would love to have your pages load in less than 1 second! What are you doing when a page loads forever. Maybe you move on right away. Too many external widgets, advertising, etc. I did not say, “It’s easy to fix a slow site,” but it should be on your to do list. I’m aware of the issues with this site and I’m looking into VPS hosting in the cloud. But I’m super busy with other things right now and as weird as it may sound my income is not directly dependent on how this site ranks respectively how fast it is at this point. What catches my eye are their cloud hosting products. Shared Hosting: Your website is hosted on one server together with hundreds or even thousands of other websites. If those other sites get a lot of traffic your sites slows down, too. Virtual Private Server (VPS): One server is partitioned into several (10 to 20) virtual servers, which appears to you like one regular computer, just only 1/10th to 1/20th that powerful. You have more control over the resources of your server. Dedicated Server: It’s all yours. Classic shared hosting, virtual private server (VPS), and even dedicated hosting have one weak point: Single point of failure! When a critical component in the server on which your website is hosted fails, your site may go down for hours or even days till the hardware has been replaced and the server restored. That’s the icing on the cake so to speak. Another advantage of cloud hosting is that it easily can be scaled according to your needs. Your blog post gets on the front page of Digg, no problem! The cloud detects the rise in traffic and provides more resources within a minute or so. Then it scales back automatically. I know this sounds like magic, but a fair warning: Shopping for a good cloud VPS host isn’t necessarily easy. You really have to read the fine print about how resources are allocated and shared, and not all of the mentioned providers offer this automatic scaling right now and maybe you don’t even need it at this point. Also note that — of course — those extra resources (CPU power and bandwidth) might need to get paid for extra. Yes, this is the playing field of geeks and techies. Getting your website to load faster is not as trivial as finding a couple of keywords to go after. All of three companies mentioned offer managed support in case you don’t have a team of your own for advanced server administration. But hosting is only one factor that determines the speed of your website. Here is an additional article that addresses the issue especially for Wordpress powered blogs. 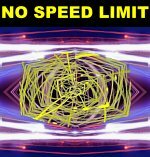 Image source: “No Speed Limit” Copyright ©2010 by John W. Furst. Some rights reserved. CC-BY-SA. Based on work by eyesplash/flickr and alicereneztay/flickr. I have my blog on blogger. Do I need to worry about speed or does Google take care of it. Sure, hosting on blogger.com, wordpress.com or typepad.com takes away the burden of having to deal with infrastructure. But you are limited in other ways, like you cannot customize the site as much as you want to and you could run into limitations in regards to terms and services of those providers more easily. Honestly I don't know if you can have your own domain with blogger, but if you are in for the long haul it always will pay off to have your own domain. Those hosting and optimization tips apply more to people who make a living from web pubslishing full-time or who represent their business. If blogging is your hobby, I wouldn't worry about it so much. Don't forget, speed is one of 200 factors that determine ranking. Relevancy and good content are still the major triggers. What a coincidence, I am writing about website performance and right now my site is slower than usual. I knew this was coming and have a few things on my list to carry out to help improve my sites loading time. The problem I have is I have far too many plugins...but I don't want to remove them! I've recently looked at Google’s speed-test program and it advices what to do - in very technical terms! Yes, too many plugins are expensive when it comes to CPU power and loading time. And some plugins actually should be ripped apart and its code put directly into the template. I really like this Serendipity S9Y.org blogging software I am using here. It separates template and code 100%. The low point here: Small developer community and NOT ENOUGH PLUGINS or TEMPLATES available. Actually (unfortunately) all other blogs I run are Wordpress, because it's the best platform for getting state of the art, hype, plugins, and connectors to other platforms. My main issue here is the server.